Home / About JAWS / Archive by category "Guiding and Important Documents"
JAWS members have access to an email listserv on Google Groups and a Facebook group. The following usage policy applies to both services. A few accomplishments of JAWS highlighted in the 2016 Annual Report listed below. A few accomplishments of JAWS highlighted in the 2015 Annual Report listed below. Do you want to learn more about the benefits and services offered to members of the Journalism and Women Symposium? Do you ever wonder how you can join a committee or how you can propose a new JAWS initiative? Read on for questions to your answers! The organization’s membership brochure for new and returning members. A few accomplishments of JAWS highlighted in the 2014 Annual Report listed below. A few accomplishments of JAWS highlighted in the 2013 Annual Report listed below. 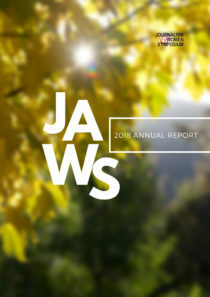 A few accomplishments of JAWS highlighted in the 2012 Annual Report. The Board of Directors of Journalism and Women Symposium reworked an earlier Strategic Plan to come up with this planning document in the spring of 2012. The organization’s bylaws, adopted by the membership.